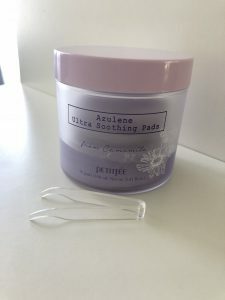 PETITFEE Azulene Ultra Soothing Pads are my newest buy from and my immediate holy grail product. I’ve tested these out for 2 weeks in a row and I am happy to report that these deliver immediate results on my skin! Sooo, off to the review…. Desert Plant Complex – Trehalose, aloe leaf water and opuntia coccinellifera extract; superb moisturizer that revitalizes and maintains moisture. Soothing Energy – Ceramide NP, sodium hyaluronate, pantherol and 6 natural extracts calm and deeply moisturize dehydrated inner skin. 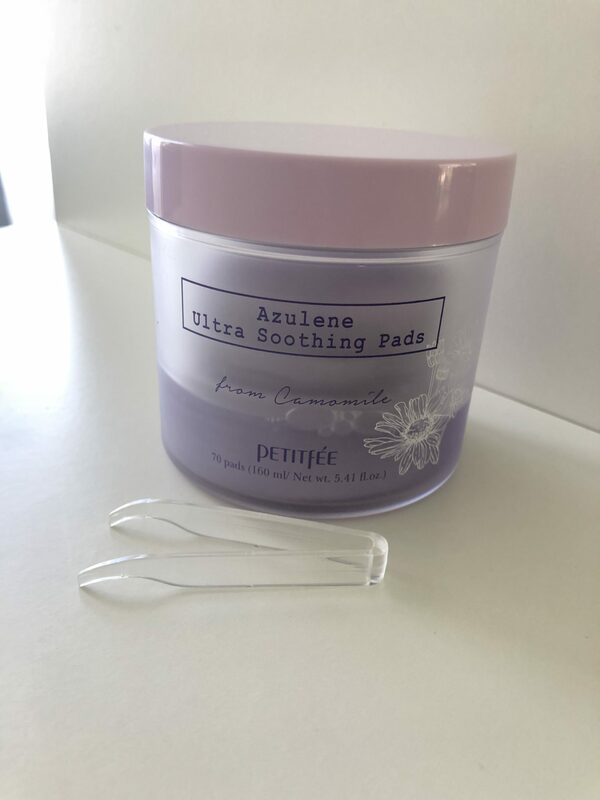 Calming Blue Azulene – The dark purple-blue color azulene, centella asiatica, madecassoside and chamomile extract soothe the skin. Perfect Fitting Pad – A perfect fitting pad with good moisture retention that does not dry easily. The dark purple-blue of this product is not an artificial pigment but azulene’s unique color. The color is vulnerable to direct sunlight, and may fade during use, but this is not related to quality. As a toner: After cleansing, tone skin with a piece of soothing pad to replenish moisture. As a quick mask/patch treatment: For intensive hydration, place the soothing pads onto areas where it feels dry. Leave it for 10 minutes. As hydrating booster under make-up: USe in the morning prior to applying your make-up. Leave on for 5 minutes. I’ve kept my eye on these pads for some time now. 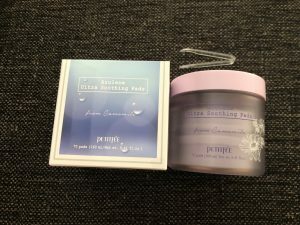 Finally, when bunch of stuff in iHerb went on sale I managed to score them at around 15 euros which was a very good deal, considering the fact that the jar contains 70 pads! 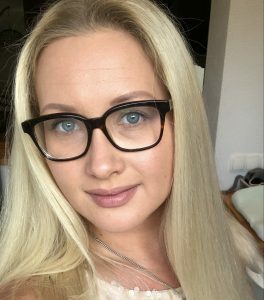 Do I like these? I love them! Why? Well, see for yourself. First of all. The packaging is very neat and sturdy. Considering the whole thing was shipped from a different continent and my iHerb boxes come smashed 99% of the time, the entire thing survived the travel very well. The tub is transparant and inside you see neatly stacked pads which are submerged in the purple-blue tinted liquid. The hue may vary from tub to tub due to the fact that the essence is photo-sensitive. 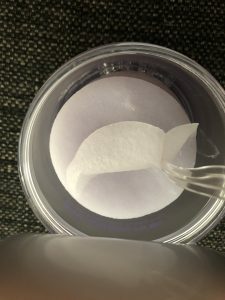 The container comes with small plastic tweezers that you should use to pick up the pads from the container. A very handy addition that I’d personally like to see in other brands (NEOGEN, please take a note). There is a little plastic shield sealing the whole thing that you should remove in order to get to the pads. Once the jar is open you sense some light fragrance. Upon vigorous sniffing I’ve figured it is a combination of white florals and lavender. Very light and pleasant smell that is not overwhelming nor artificial. The pads are composed of thin synthetic fabric that resembles thin sheet of felt. Careful, once you pick up pads they may drip a bit at first. Each pad contains a lot of essence. If you use it just to wipe and tone your face with, there is plenty to go over your face and neck and some of the Décolletage. I tend to use these pads as a patch treatment after I do my cycling outdoors, or after going to the gym. As I tend to get a super-red face after sports, these are a must-have for me when I need to recover my face a.s.a.p. After 10-15 minutes application my cheeks are not glowing like a hot iron anymore. It never happens naturally within the same period of time so I know it is 100% the effect of these pads. And yes, you may say, well it is cooling your face, blood vessels are shrinking, hence less redness. I know, I thought of it as well and put it to the test. 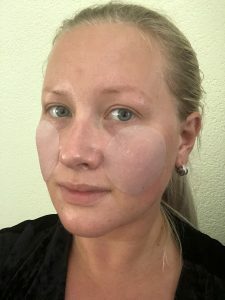 I’ve applied a regular sheet mask on my face and the results were quite poor in comparison to those pads. That’s why I am super amazed by how effective these pads are. I’ve tried using these as a quick make-up primer as well and they do an amazing job for it. If you have a sensitive and dry/dehydrated skin, these pads may become your holy grail. I know they are mine!